Frustration tends to run high when anticipating hours of fun, you happen upon an online casino, and the first thing that pops up on your screen is “Your country is restricted from playing on this site.” So, it’s with bubbling excitement that we can present to you a new and fresh gaming establishment, catering exclusively for South African players. 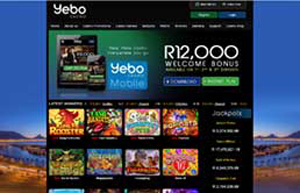 Yebo Casino is still relatively new to the virtual gambling market, as far as years in operation go, but are by no means a straggler, and offer only the best of the best to the citizens from the land of sunshine, boerewors, and braaivleis. Banking through Yebo Casino is a quick and secure undertaking with the various methods of options on offer, which include Visa, MasterCard, EasyEFT, Secure Instant Deposit, Bitcoin, Neteller, Skrill, ecoPayz and Wire Transfer. Funding your account couldn’t be easier – simply head over to the cashier, choose the deposit option, your preferred deposit method, select your amount, and your account will instantly be credited with the processed funds. Withdrawals are prompt and convenient when using the e-wallet options, and payouts can occur within 24 hours when you choose Bitcoin as your withdrawal method. The EasyEFT method is a huge drawing card for South African players wanting to deposit or withdraw funds, as this option facilitates direct fund transfers from the 5 major banks, including Nedbank, FNB, Capitec, ABSA and Standard Bank. You need not worry about your banking security at Yebo Casino, as they utilize the latest SSL encryption technology on their platform, thereby ensuring the complete safety of all your processed transactions. All new members hailing from South Africa, Lesotho, Swaziland, Botswana, and Namibia, who are signing up for their first account at Yebo Online Casino, are eligible to receive the generous welcome bonus on offer. They have the opportunity of collecting R 12,000 in free bonuses over the first three deposits made: The first deposit matches 150% up to R 2, 250, the second is a 75% match up to R 3,750, and the third deposit matches 50% up to R 6,000. New players also receive 50 free spins to be played on the 5-Reel Caesar’s Empire Slot machine. Once you have signed up for your new account, contact the support staff through Live Chat to validate your account, and your free spins will be credited to your account. Yebo offers a leaderboard promotion, where for every wager you place, you earn comp points and the more points you earn during the promotional timeframe, the higher up on the leaderboard you move, putting you in line to become one of the lucky winners for a share of the R35,000 prize on offer. There is also a Daily Rebate program available on which the casino will pay you a guaranteed daily 13% on all losses made from deposits without a bonus. This cashback is calculated on your losses from the previous day and will reflect in your account on the subsequent morning. Yebo Casino additionally offers a ‘by invite only’ VIP program to selected customers, so our advice would be to continue playing your heart out – management will soon notice your skills and get in contact with you to join up for this exclusive offer. A lovely “Refer-a-Friend” incentive is also available, where every referral has the opportunity of awarding you with 100% of your friend’s first deposit, up to a maximum of R 5,000. The money is credited to your account balance and is subject to a 50x wagering condition. Yebo Online Casino offers their clients a safe and secure gaming platform on which the latest SSL encryption technology has been incorporated, thus ensuring complete security of processed transactions and personal information. On opening Yebo’s landing page you’ll be rewarded with a beautiful and nostalgic view of Table Mountain Bay as the background image, and a roll-down menu taking center stage on the page. All applicable user information is prominently categorized under convenient tabs. The design is uncluttered and easy to navigate, making it the ideal interface for even the most novice gamer. Although Yebo Casino does offer downloadable software, it is much easier to simply register your account and play on the instant gaming version of the site, directly accessible through your computer browser and supported by all major search engines browsers like Chrome, Firefox, etc. The Yebo Mobile Casino is just as straightforward, with no need to download a dedicated application, as the gaming arcade is accessible through an HTML5 platform, making it conveniently operational on most smartphones and tablets, including iPhone, iPad, Android, Windows, and Blackberry’s. Yebo Online Casino boasts with a gaming library of 130+ games, powered by top developer Realtime Gaming, who have a stellar reputation for providing the most graphically pleasing and auditory stimulating games. Yebo offers a lovely collection of slot machines which include progressive jackpots, multiway action, and three and five-reel machines, with a few of the hottest titles currently available being: Crystal Waters, Hillbillies Cashola, Alladin’s Wishes, Cleopatra’s Gold, and Megasaur. The poker and video poker library is one of the most assorted currently on offer, with both single and multi-hand options available, and gamers are able to select out of multiple variants, including Caribbean Stud, Pick ‘em Poker, Deuces Wild, Jacks or Better, All-American Poker, and Triple Double Poker, among others. At the Table games section, you will find a profusion of virtual roulette, dice and card games with multiple variations of classic titles. The Blackjack names include Standard and European Blackjack, Perfect Pairs, Super Fun 21, and Pontoon, and the Roulette category throws out Standard and Multiplayer French-style Roulette. You can also opt to play Sic Bo, Casino War, Baccarat, and Craps, and the specialty games have Bonus Bingo and Keno on the menu. Should you happen to run into an unsolvable problem, Yebo Casino offers a range of customer assistance options for you to reach out on. Friendly and experienced staff are on duty 24/7 at the call center, and you can give them a quick ring on toll-free 0800 999 043. You can also make use of the email option available at [email protected], or get into instant contact through their Live Chat option. There is also a comprehensive FAQ section available on their website if you would like to have a peek. It appears that the bundu-bashing South African locals have finally been granted the opportunity to take a step into civilization with the appearance of a vibrant and trustworthy online casino catering specifically to their wild needs. Yebo Online Casino is a move in the right direction to tame these natives with an amazing array of multiple awesome features on offer. This gambling establishment is still a baby in the eyes of the industry, but this should never be held against them, as they have proven through a period of 3 short years to be a strong contender in providing a top-notch gaming arena for novice and seasoned players alike. A safe and secure portal, huge variety of names in the games library, multiple methods for depositing and withdrawing, a substantial welcome bonus and other promotions, and an excellent customer support system, makes Yebo Casino one seriously devoted gambling platform, and we happily award them our much sought after No. 1 spot on our list of recommended online casinos for South Africans. There isn’t much more a player could ask for, and with that in mind, all that’s left to say is: yes, yes, YEBO YES! Where do I find Yebo “No Deposit” bonus codes for 2017? We can help you! You can use the following codes which are allocated for the first three deposits made. 1st deposit – “WELCOME150”; 2nd deposit – “WELCOME 75”; 3rd deposit – “WELCOME50”. Is there a mobile option for Yebo Casino? Yes, there is a superb online Yebo casino available directly through any HTML5 powered smartphone or tablet, accessible directly through your device browser. Is Yebo Casino legal in South Africa? It most certainly is. A Curacao license holder and trading in ZAR makes this casino the optimal choice for South African players.